Posted on March 6, 2009 by Chad O. Quite a few changes have been announced by Asustek this week. The biggest is that Asustek will be phasing out the 7-inch Eee PC segment of its Eee PC family, according to Asustek’s chairman, Jonney Shih. This falls in line with comments made around three weeks ago that Asustek would be simplifying its Eee PC line, with an emphasis on 10-inch models (8.9-inch models would still be around), and Shih reiterated that emphasis in comments made to ZDNet at CeBIT 2009 this week. He mentioned the screensize as a major factor, which makes sense – most people have indicated that they prefer at least 1024×600, while the 7-inch models only allowed for 800×480. – Mainstream – $299 – $399 USD, such as Eee PC 1000HE and Eee PC 1008HA (see announcement). Interestingly enough, according to Samson Hu, the manager of Asustek’s Asus Eee PC business, Asustek estimates that the convertible/Tablet PC touchscreen Eee PCs – the Eee PC T91 and Eee PC T101, will make up 10% of the company’s Eee PC shipments for 2009. DigiTimes is also reporting that Asustek is looking at Eee PCs based on Qualcomm’s platform. Hu has said that Asustek does not have plans to produce non-Intel Atom-based Eee PCs at this point, but they are evaluating other platforms. Last month in an interview, Hu mentioned that Asustek was looking at Android based netbooks for its Eee PC line, and had gone so far as to assign engineers to evaluate the Android platform. Hu also made comments that they don’t believe that Intel’s CULV platform will impact mainstream markets, and instead will be concentrated in emerging markets. The Asustek motto (at least as far as Eee PCs are concerned) has also been changed from “Rock Solid. Heart Touching” to “Inspiring Innovation. Persistent Perfection”. The Eee PC branding was also changed – it did stand for “Easy to learn, easy to work, easy to play”, and it has been changed to “Easy, excellent, exciting”. 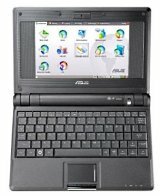 This entry was posted in Announcements, ASUS, Netbook, News, Tablets, Touchscreen. Bookmark the permalink.